The classic costuming textbook used extensively in professional theatre training programs on costuming is back and better than ever! 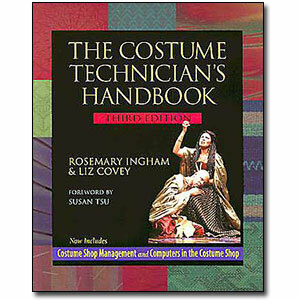 In the third edition of The Costume Technician's Handbook, Rosemary Ingham and Liz Covey once again draw upon their many years of hands-on experience in costume design and technology. Now they add information gleaned across the country from shop managers and staff about their methods and supplement it with images of some of the very best theatrical costume work to be seen today. And they continue to provide the most complete guide to developing costumes that are personally distinctive and artistically expressive. Rosemary Ingham and Liz Covey have been attentive to technical developments as well to keep you up to date and ready for action. They have expanded The Costume Technician's Handbook to include: two new chapters on costume shop management and the use of computers in costume shops; instructions for using new materials; a substantial updated bibliography; lots of brand-new color and black-and-white photographs; new appendixes on mathematics for technicians, health and safety standards, and much more. Rosemary Ingham was a costume designer and writer. Her design work was been seen at regional theatres across the United States for more than three decades. She is the author of From Page to Stage: How Theater Designers Make Connections Between Texts and Images, and, with Liz Covey, The Costume Designer's Handbook and The Costume Technician's Handbook. She died in July of 2008. Liz Covey is a freelance costume designer whose work has been seen in England's and America's leading theatres. She has taught at Barnard College, Columbia University, Marymount Manhattan College, and Bennington College.